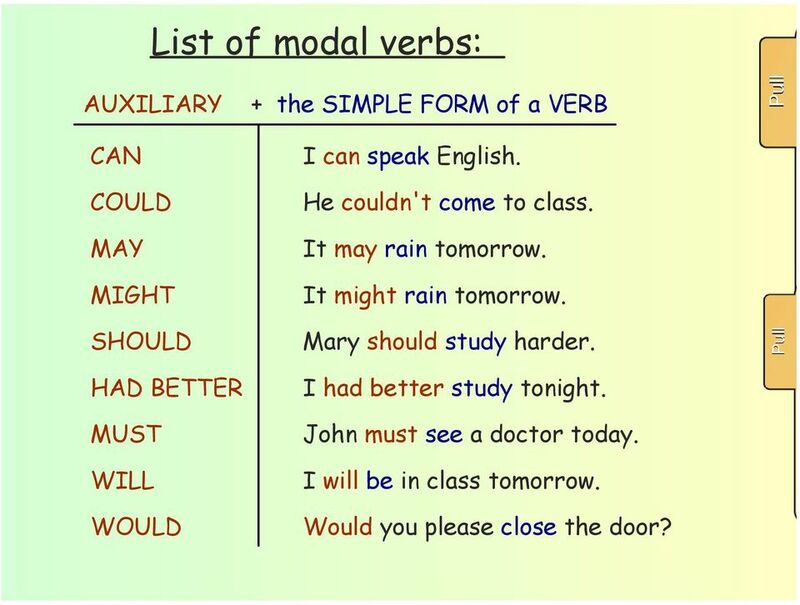 Download "Název projektu: Multimédia na Ukrajinské"
4 List of modal verbs: AUXI AUXILIARY CAN + the SIMPLE FORM of a VERB I can speak English. Pull HAVE HAVE OUGH COULD He couldn't come to class. MAY It may rain tomorrow. MIGHT It might rain tomorrow. SHOULD Mary should study harder. Pull HAD BETTER I had better study tonight. MUST John must see a doctor today. WILL I will be in class tomorrow. WOULD Would you please close the door? 6 ex. 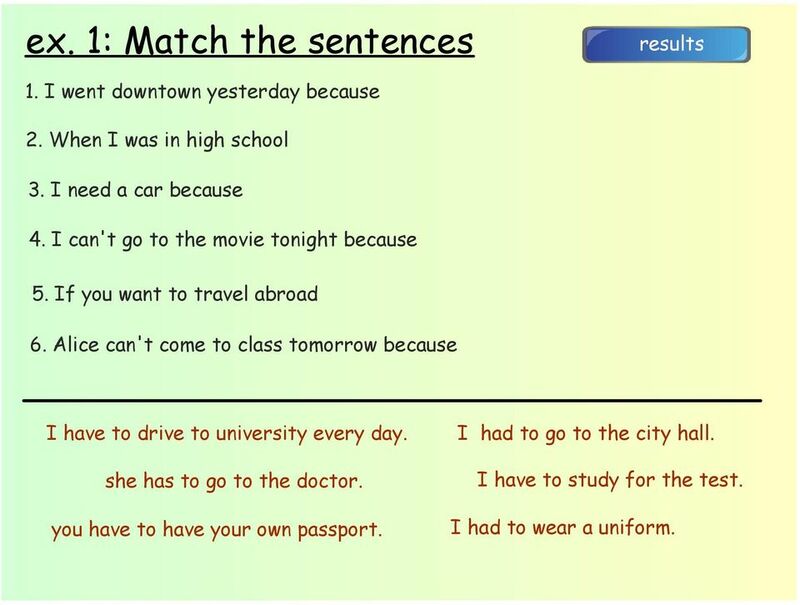 1: Match the sentences results 1. I went downtown yesterday because 2. When I was in high school 3. I need a car because 4. I can't go to the movie tonight because 5. If you want to travel abroad 6. Alice can't come to class tomorrow because I have to drive to university every day. she has to go to the doctor. you have to have your own passport. I had to go to the city hall. I have to study for the test. I had to wear a uniform. 7 ex. 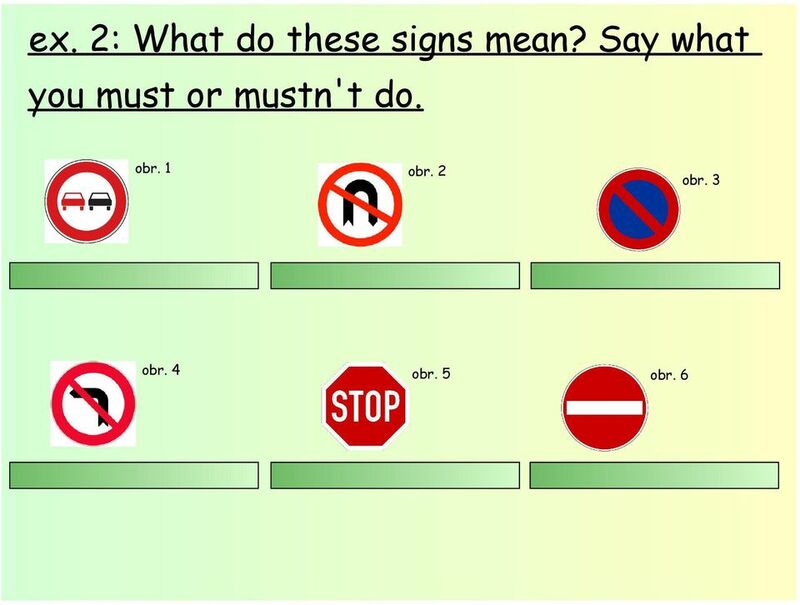 2: What do these signs mean? 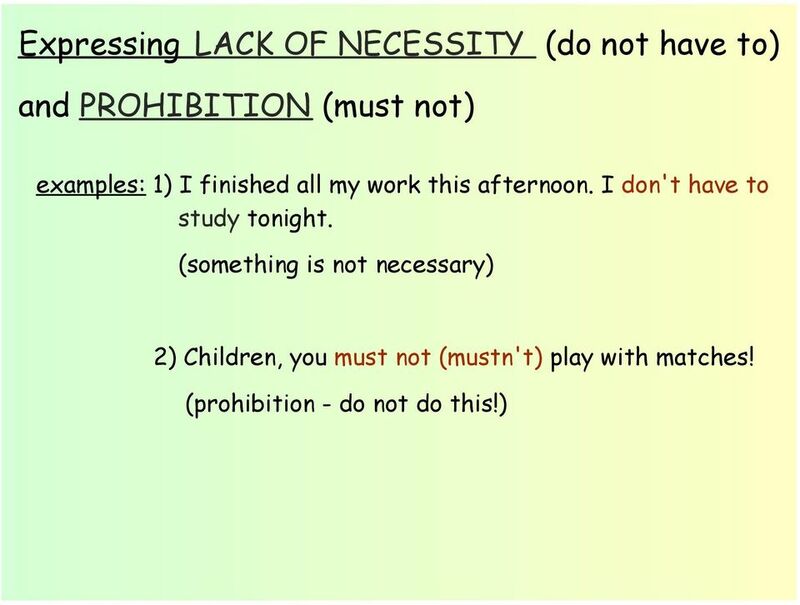 Say what you must or mustn't do. obr. 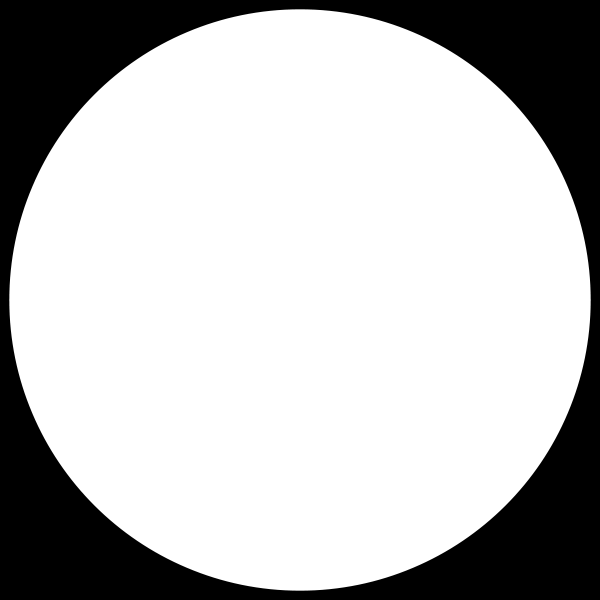 1 obr. 2 obr. 3 You mustn't overtake. You mustn't turn around. You mustn't park/wait here. obr. 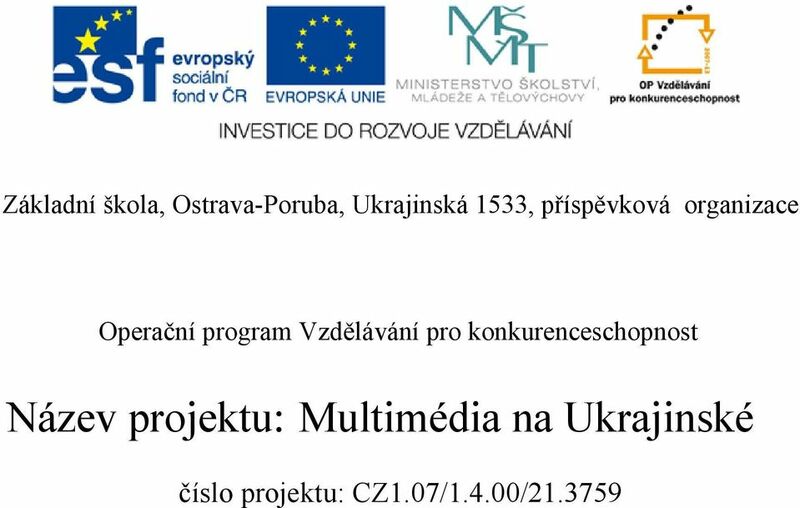 4 obr. 5 obr. 6 You mustn't turn left. You must stop. You mustn't enter. 9 ex. 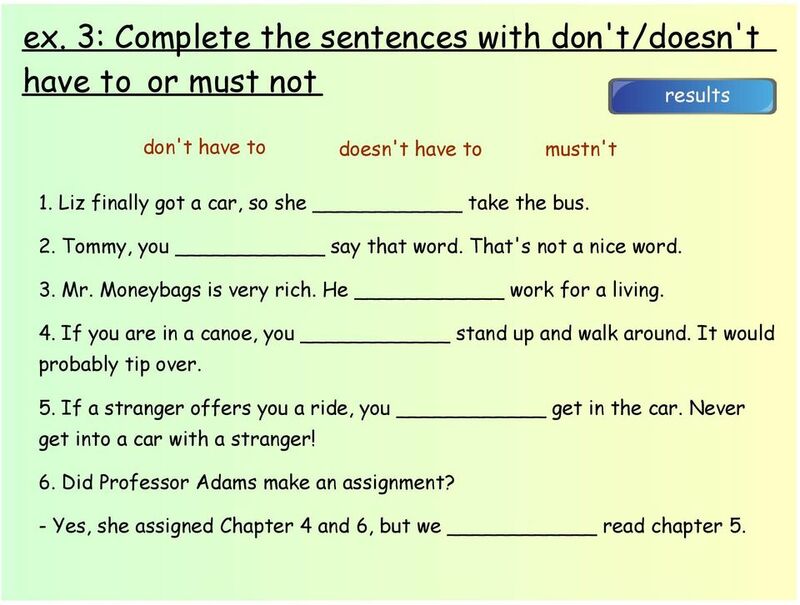 3: Complete the sentences with don't/doesn't have to or must not don't have to doesn't have to mustn't results 1. Liz finally got a car, so she take the bus. 2. Tommy, you say that word. That's not a nice word. 3. Mr. Moneybags is very rich. He work for a living. 4. If you are in a canoe, you stand up and walk around. It would probably tip over. 5. If a stranger offers you a ride, you get in the car. Never get into a car with a stranger! 6. Did Professor Adams make an assignment? - Yes, she assigned Chapter 4 and 6, but we read chapter 5. 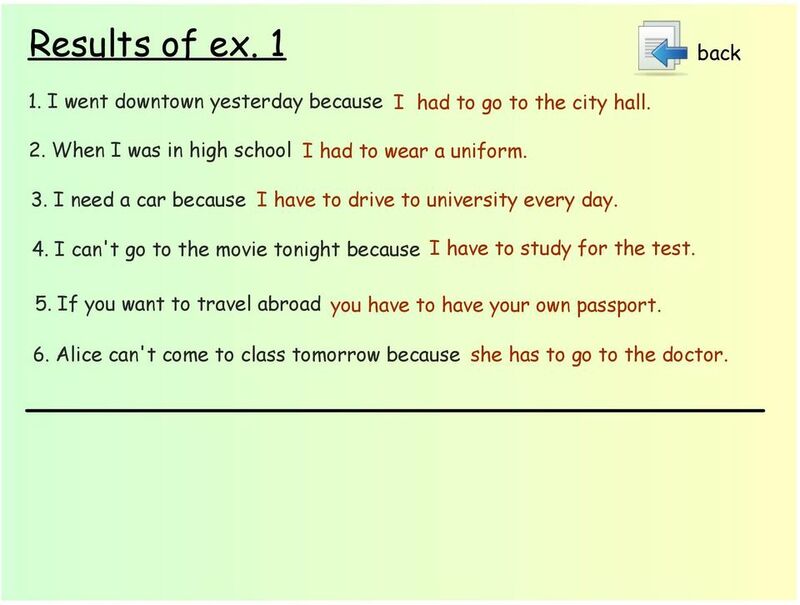 11 Results of ex. 1 back 1. I went downtown yesterday because I had to go to the city hall. 2. When I was in high school I had to wear a uniform. 3. 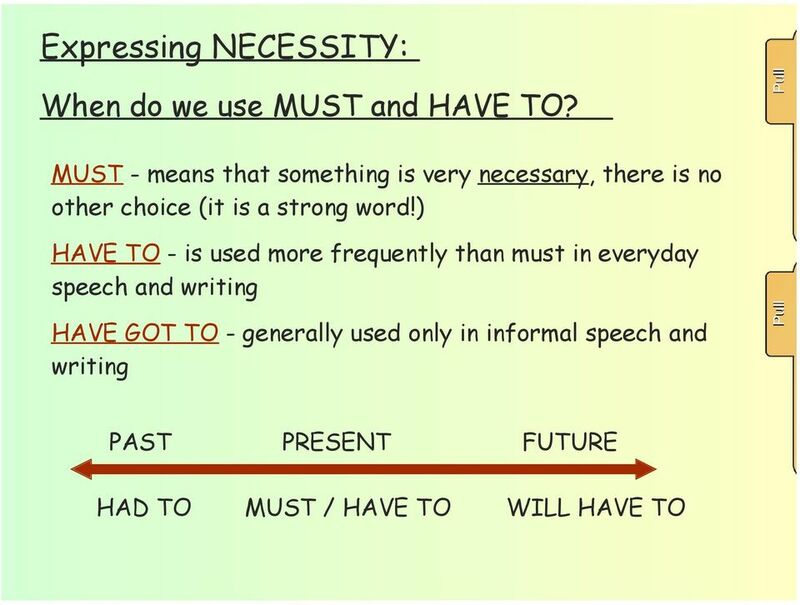 I need a car because I have to drive to university every day. 4. I can't go to the movie tonight because I have to study for the test. 5. If you want to travel abroad you have to have your own passport. 6. Alice can't come to class tomorrow because she has to go to the doctor. 12 ex. 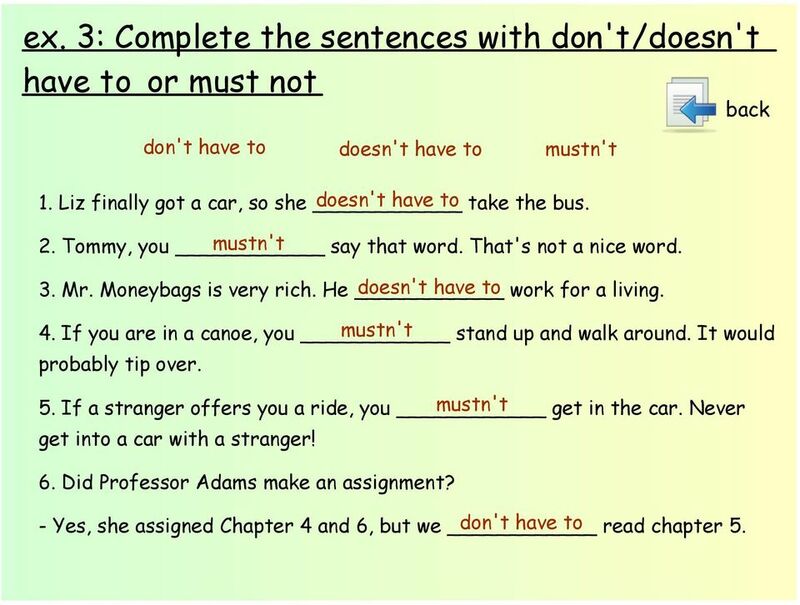 3: Complete the sentences with don't/doesn't have to or must not back don't have to doesn't have to mustn't 1. Liz finally got a car, so she doesn't have to take the bus. 2. Tommy, you mustn't say that word. That's not a nice word. 3. Mr. Moneybags is very rich. He doesn't have to work for a living. 4. If you are in a canoe, you mustn't stand up and walk around. It would probably tip over. 5. If a stranger offers you a ride, you mustn't get in the car. Never get into a car with a stranger! 6. Did Professor Adams make an assignment? - Yes, she assigned Chapter 4 and 6, but we don't have to read chapter 5.